The original BAD idea behind this bill was that Excelon’s Nukes were not profitable so they needed a subsidy from the State of Illinois or they would have to shut down. That subsidy would come from including the Nukes as part of Illinois’ Clean Energy Portfolio. Yah right, like Nukes are a clean source of energy. But this 2016 version rolls Clean Coal, Renewable Energy and Nuclear Power into the same package. Just how bad is this Bill? There is no such thing as Clean Coal. HELP US KILL EXELON’S BAILOUT BILL! Less than a week ago, Exelon– the owner of Illinois’ nuclear power industry and one of the largest energy companies in the world– introduced a new bill to the Illinois Senate. SB 1585 is disguised as a “new generation” energy plan for our state, but is nothing more than a giant bailout for Exelon. hands, and puts them straight into the pockets of Exelon. Our tax dollar should not be used to keep dangerous nuclear energy in business. Instead, our tax dollars should be invested in the clean energy future that our state and planet needs! BEAT BACK THE EXELON SHAKEDOWN! 3 Things YOU can do THIS WEEK! Submit a Witness Slip AGAINST this bad bill! Go there and read. More important, do everything they say and show up at the State Capitol if you can. More next week. They take to much room, they lower land values, they don’t generate enough income, they are unnecessary, and finally they are a blight on the land. I believe that Grid upgrades are require for the use of alternative energy sources and so I say “Build Baby Build”. A second high-voltage transmission line — this one intended for power from Kansas wind turbines — is making its way toward central Illinois. The Grain Belt Express power line would carry electricity from wind farms in western Kansas across central Missouri and Illinois to Indiana, following the same general corridor as the Illinois Rivers power line already announced by Ameren Transmission Co. of Illinois. Illinois Rivers also would carry wind-generated power west to east. Kansas and Indiana utility regulators have approved the $2 billion Grain Belt project, www.grainbeltexpresscleanline.com, and regulators in Missouri plan to hold public hearings this week. As with the Illinois Rivers project, the Grain Belt Express has generated controversy. Proponents argue for jobs and clean energy. Opponents fear falling land values and health hazards. Illinois is expected to be the next regulatory stop for the 750-mile power line. “We’re taking a state-by-state approach to our regulatory process,” said Adhar Johnson, project manager for Grain Belt Express. I got an email from Southern Illinois that said 30 big rigs had rolled through town yesterday morning. I figure that that is enough for 2 wells. It seems like some drilling company has decided to “go for it”. Which makes sick and disgusting sense. Many of the leases die at the end of April. I suspect that these will be test wells, because no one knows what is down there. It takes about 7 days to to drill a well and frack it. That would have the wells beginning to come in as the lease expires. This is what I said in print. I am writing to argue for a moratorium against fracking in Illinois (SB 1418). Chicago environmentalists argue that “fracking is going to happen anyway.” That is a total capitulation to the industry. The bill that the environmentalists endorse (HB2615) is amazing in the things it does not prevent. It does not force the frackers to recycle their water, allows for methane flaring, allows wells within 300 feet of water sources, allows wells within 500 feet of a house, does not allow adequate testing of produced waters especially for radiation and then allows that waste to be deep well injected and finally allows for the state to overrule counties and municipalities who do not want fracking or more protective measures. This does not include the actual damage that they do to the environment, like damaging the roads where they work, and flaring the natural gas that should be harnessed as a fuel source and the constant noise pollution that the above activities produce. I was visiting a friend in Colorado when such a well was put in and the noise and smell alone were enough to sicken me. Go there and read. They did a whole 5 page article on the issue. More later. Are There Green Cemeteries in Illinois? I am happy to report that the answer is finally, YES! The Green Burial Council in California recently approved Roselawn Memorial Park for green burials. You can now be buried in Illinois without a casket, without embalming, without anything but a shroud if you want. I do not personally think that a green burial ground has to be approved by the Green Burial Council, but they have some strict standards that make sense, and their mission is great. In a previous life, I worked in the architectural world, and saw first-hand what it was like dealing with the logistics of becoming LEED certified, and know how hard it can be. Additionally, it is very expensive to become “Certified Organic”. I think it’s worthwhile to recognize any cemetery or burial product willing to become more natural, and I will support any company that tries to be better. Here is their information. They do not seem to have a working website yet. I will keep you posted and update after I contact them directly. I know I said I was done with the residential housing market last Friday. I was talking to Bob Croteau about which side of the insulation the vapor barrier should be on if you are insulating the upper portion of your basement and he mentioned this in passing. By the way the answer is the vapor barrier should be on the basement side of the insulation and he suggested only insulating 4 feet of the basement from the top of the basement wall down. After that you are pretty much wasting your time. On to the solar rebate. The reason I said to hurry and get it if you were thinking about solar it is because it is on a first come first serve basis. CWLP’s SOLAR REWARDS program offers rebates of up to $15,000 per household or business to CWLP electric customers who install solar electric—also known as photovoltaic (PV)—systems at their residential or commercial facilities. To qualify for participation in the program, customers must meet all eligibility criteria, including being pre-approved prior to purchasing any equipment or starting any work. The SOLAR REWARDS rebate program is being offered on a first-come/first-served basis until funds budgeted for the program are exhausted. The rebate is calculated at $1,500 per kilowatt (kW) of system capacity. Qualifying systems can range from a minimum of 0.5 kW to a maximum of 25 kW. Rebates will be provided in the form of a CWLP bill credit. For rebates exceeding $1,000, applicants may request their rebate payment in the form of a check, but must provide CWLP with their social security number or FEIN number. Customers have 90 days from the date of their pre-approved application to complete their PV system installation and submit their post-installation documentation to CWLP. Failing to either meet this deadline or receive a deadline extension from CWLP will result in the loss of rebate eligibility. To apply to participate in the SOLAR REWARDS Rebate Program, use the Pre-Approval Application in the online SOLAR REWARDS Application Packet. To request a hard copy of the Packet, contact the CWLP Energy Services Office by phone at 789-2070 or by email. Photovoltaic systems convert energy from the sun into electricity using panels that are installed to take maximum benefit of available sunlight. Some systems are even designed to allow the panels to “track” the sun throughout the day. The lifespan of a typical PV panel is approximately 25 years. Residential applicants can combine CWLP’s SOLAR REWARDS rebate with Federal tax credits or State of Illinois incentives to make solar a more affordable renewable resource option. For more information about the SOLAR REWARDS Rebate Program or about photovoltaic systems, contact the CWLP Energy Services Office at 789-2070 or nrgxprts@cwlp.com. You wonder why I go on about all the things you can do in your house to save power. Well the following article tells the whole story. As I said this a joke and the joke is on you. They will never get to the “smart” meters and once they do, so what. Then all you become is a part of the utilities load flattening program. Big whoop. Who wants to do laundry at 2 o’clock in the morning. Nice piece of writing though. Ameren Illinois, a subsidiary of Ameren Corporation, took its first step in implementing its Modernization Action Plan (MAP) on Tuesday, Jan.3. The plan will provide customers with a more reliable and modernized electric distribution system. In a press release, Ameren said that over the next decade an additional $625 million will be invested in updating the Ameren Illinois electric delivery system, while also creating 450 new jobs during the program’s peak year. Ameren Illinois serves 20,767 customers in Sangamon County. “Today’s filing with the Illinois Commerce Commission marks the beginning of an initiative that will enable Ameren Illinois to modernize its electric distribution system over the next 10 years in order to meet the service expectations of our customers in the 21st century,” said Craig Nelson, senior vice president of Ameren Illinois. The filing includes the deployment of about 750,000 automated “smart” meters, greater use of advanced distribution system automation, the modernization and expansion of electric substations and the installation of new transformers. Smart meters allow consumers and utility companies to monitor electricity more closely during the day through the usage of wireless transmitters, while also allowing a utility company to “talk” to the meters and adjust power usage and distribution throughout the day. Morris said that there is the potential, for people who choose to use the “time-of-use service” to save money. Tim Landis is one of the best writers left on the State Journal Registers staff. This Green Center will be a boon to the Springfield community. Lincoln Land Community College expects to begin training about two dozen students for “green” jobs early next year through two pilot programs made possible by $600,000 in federal training grants. The Renewable Energy Academy and the Green Construction Academy will provide intensive training — classes are 9 a.m. to 4 p.m. Monday through Thursday — for jobs in renewable energy and energy-efficient building. “We are looking at a lot of new skills and jobs that have not been there in the past,” Julie Rourke, LLCC director of workforce development, said Thursday. The renewable-energy classes are scheduled to begin Jan. 9 and the classes in green construction on Feb. 13. Both continue into mid-June. Rourke said the school hopes to enroll 15 students in renewable energy and 12 in green construction. There will be no cost to the first group of students, because the federal grants are paying for the expense of setting up the program, including equipment. But she said the four-days-a-week schedule will take a strong commitment. The grants, $350,000 from the U.S. Department of Education and $250,000 from the U.S. Department of Labor, were awarded through the LLCC HIRE Education program. The goal is to make the classes self-sustaining once the grants expire at the end of 2012. LLCC Green Center manager Julie Bates said classes will cover a variety of renewable-energy and energy-efficiency skills, including solar, small wind systems, geothermal, green construction, plumbing and heating, landscaping and site planning. Man the State Fair was kinda disappointing for me this year, at least from an energy perspective. Now I admit that the first year I started posting here was a pretty heady year. 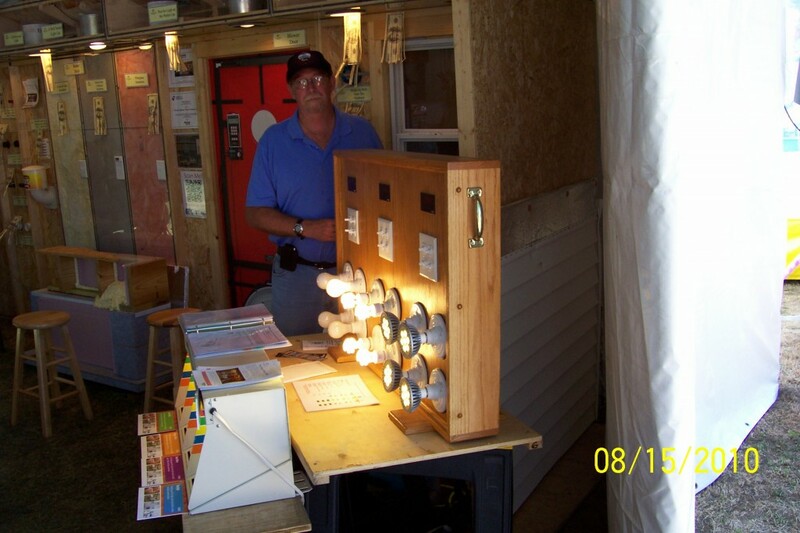 IDE had 2 booths for energy conservation. One was for seniors and one for the general public. Conservation World was packed. The Sierra Club had a tent with CWLP complete witha solar exhibit and a hybrid car. There were doors and windows guys galore in the Exhibition Hall, and even a guy selling wind turbines. The AG Equipment section even had an exhibit about biofuels. This year there was nada until I stopped at the “don’t mess with powerlines” guys tent (sorry – Live Line Demos) and saw the Wall Of Efficiencies display that was sharing space with him. Here is my picture. That is Aaron Ridenour of PPI. According to him, they originally got the Wall to take to there members Board Members meeting but since then it has been to North Dakota, Kansas and Washington DC. They were actually in a Senate Hearing concerning a Coops Bill. tilized by PPI and its member cooperatives over the past few years. The sixteen foot “Energy Efficiency Walls” illustrate various opportunities for air infiltration or leakage within the common home due to poor construction practices and materials. The displays address: energy efficient construction practices and materials, and energy efficient equipment and technologies. The proper use of caulking around penetration points in the home’s external walls, such as window and door openings, gas, water, AC and heating system fuel lines and ventilation systems, and the selection and installation of energy efficient insulation materials, ventilation equipment and lighting systems are just a few of the energy efficient items illustrated in the Walls. Utilizing the displays at member cooperatives’ annual membership meetings, NRECA and Touchstone Energy regional events, community college workshops and educational classes, … homebuilder shows, county fairs, legislative briefings in Washington DC to promote energy efficiency loan programs and other events, … over 400,000 consumers have been exposed to the educational opportunities of the Energy Efficiency Walls since 2009. NEW THIS YEAR- The Illinois State Fair will be offering Bargain Bracelets for all rides (excluding Giant Slide and SkyGlide). It will be conveniently available for purchase at the Carnival and Adventure Village when you arrive to enjoy the fair. This Bargain Bracelet will replace Children’s Miracle Network Wristbands. Experience unlimited rides with a Bargain Bracelet for $25.00! Grandstand reserved seats and track tickets on sale Saturday, April 30, 2011, 10:00 a.m. at ticketmaster.com and Ticketmaster Phone centers (800-745-3000, TTY-800-359-2525) and all Ticketmaster outlets. Grandstand ticket office will accept Mail Orders starting Monday, May 30, 2011. Grandstand box office will open for walk-up sales starting June 4, 2011 at 9:00 a.m. All adults and children 3 years of age and older MUST have a ticket for Concerts.MAIL ORDER WILL BE ACCEPTED – after May 30, 2011 at: The Illinois State Fair Ticket Office, P.O. Box 19427, Springfield, IL 62794-9427. Order tickets via U.S. mail with our order form. For years Springfield’s CWLP Department has been a black hole. No matter what the form of government, NO Mayor has ever understood the city owned utility’s finances. As a result mysterious things are always going on there. The 50 million $$$ power buying contract that went belly up came as a complete surprise to everyone in the 1990s. The coal contracts in the 1980s were even more questionable. Now they are saying “because of the depressed economy” we will never make our own budget surpluses for the year. Give me a break. People are using less energy it is true. But that is gasoline not electricity. Something ain’t right. City Water, Light and Power’s chief engineer Tuesday described the state of the city-owned utility as stable, with its future largely dependent on the overall economy. “With the economic conditions if they return, power prices will go up, and some of those revenues that we had lost and anticipated having, hopefully those will return, and that will improve the economic stability of the utility,” said Eric Hobbie, after an update on the utility to aldermen. The new, 200-megawatt Dallman 4 was expected to generate millions of dollars annually from selling surplus power. But revenues have fallen far short of projections largely because of a depressed energy market. CWLP’s spending plan for the fiscal year that began March 1 totals about $352 million, an increase of 10.8 percent over the previous year. Projected electric fund expenses total $295.6 million, an increase of 8 percent. Water fund expenses total $56.6 million, an increase of 27 percent, although that can largely be attributed to capital improvements that will be paid for with prior water rate hikes. CWLP faces its share of challenges in the years ahead, including an aging work force and new federal laws and regulations, Hobbie and other CWLP officials said. Aging equipment is another concern. Hobbie, who took over as chief engineer in 2009, said about 25 percent of CWLP’s 700 employees are over the age of 50 and have more than 20 years of experience. He said the utility tries to promote from within, but noted there is a “big gap” between younger employees and those on the verge of retirement.